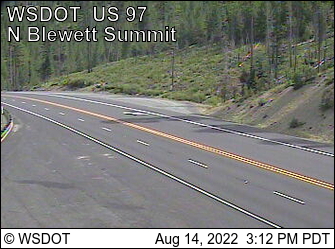 The traffic cam video below (courtesy of Washington State Department of Transportation) features live feeds of the Blewett Pass Summit on US Highway 97, a route running north to south through the center of Washington State. This camera points southeast US Highway 97, and operates 24 hours a day with images refreshed every 5 minutes. The elevation is 4,102 feet / 1,250 meters. Please remember to check your route on the Washington State Department of Transportation (WSDOT) Travel Alerts page for road and weather conditions.